Република Молдовеняскэ Нистрянэ Invalid language code. Приднестро́вская Молда́вская Респу́блика Invalid language code. Придністровська Молдавська Республіка Invalid language code. "We sing the praises of Transnistria"
1 Russian is the main official language and the lingua franca. 2 Linguistically the same as Romanian. 3 Limited to breakaway Abkhazia and South Ossetia, see Community for Democracy and Rights of Nations. 4 Moldovan leu used in the localities under Moldovan control and in the security zone. 5 .ru and .md sometimes used. Transnistria (also called "Trans-Dniestr" or "Transdniestria") is a breakaway territory located mostly on a strip of land between the Dniester River and the eastern Moldovan border to Ukraine. Since its declaration of independence in 1990, and especially after the War of Transnistria in 1992, it is governed as the Pridnestrovian Moldavian Republic (PMR, also known as "Pridnestrovie"), a state with limited recognition which claims the territory to the east of the river Dniester, the city of Bender and its surrounding localities located on the west bank. 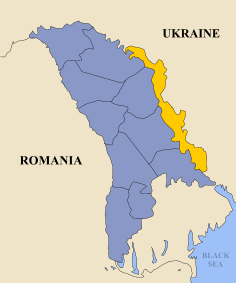 The Republic of Moldova does not recognize the secession and considers the territories controlled by the PMR to be part of Moldova's autonomous region of Stînga Nistrului ("Left Bank of the Dniester"). ↑ Herd, Graeme P.; Jennifer D. P. Moroney (2003). Security Dynamics in the Former Soviet Bloc. Routledge. ISBN 0-415-29732-X.